All of us here at The Reel Place are pretty certain we know who’s going to win when next Sunday rolls around. We’re so certain in fact that we’re posting our guesses here and going head-to-head in a winner-take-all contest where we’ll see just which one of us actually knows what the crap we’re talking about. 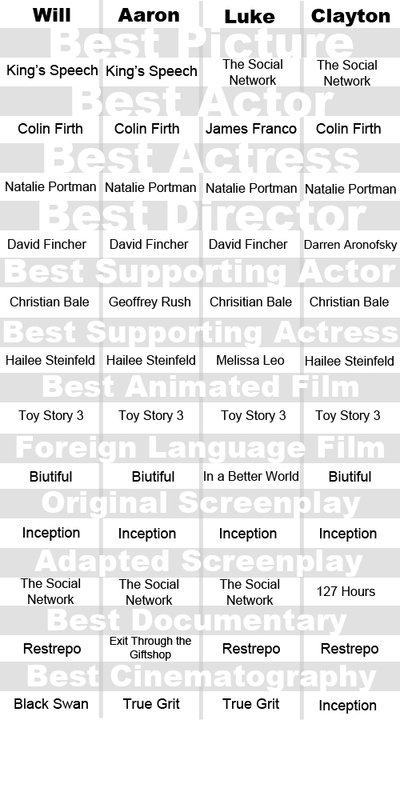 These are the 12 major categories in the Oscars. It’d take far too much time to guess all the outlying categories no one cares about. Without waiting a second longer, here’s our guesses for the Oscars. May the best man win (I know I will). Who do YOU think will take home the coveted prize of The Reel Place’s most knowledgeable contributor?